The Johns Hopkins Master of Business Administration/Master of Science in Applied Economics responds to the needs of students who envision careers blending business and economics. Students may complete the MS in Applied Economics portion of the degree fully online or fully on-site in Washington, D.C. Both Carey & AAP can be attended simultaneously. View detailed MS in Applied Economics degree requirements here. Students may complete 18 elective credits or 12 MBA concentration credits and 6 elective credits. Students planning to complete an MBA concentration should notify their MBA academic advisor. *The only concentrations currently offered online are: Health Care Management, Leading Orgs, and Financial Businesses. Applications for the MBA/MS in Applied Economics dual-degree program must submitted to the Krieger School of Arts and Sciences Advanced Academic Programs. The admissions committees of both schools will review each application. 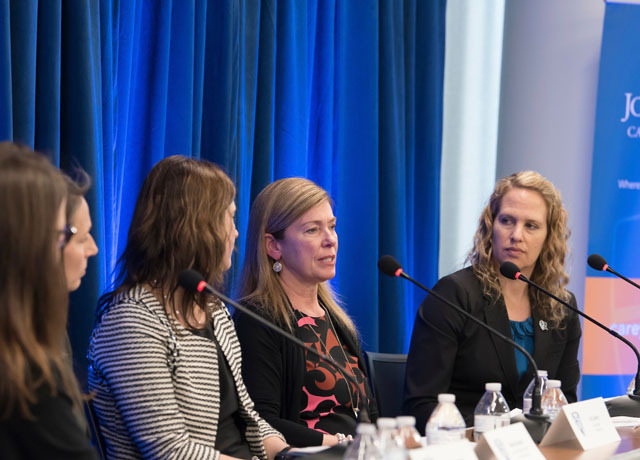 Women in Leadership: Opportunities and Challenges from the Athletic Field to the Boardroom” brought together a diverse group of women leaders to discuss how athletics and sports have contributed to their development as both leaders and executives.